PAYG is an exciting new evolution of AEG’s renown Firefly product. Customers who have Firefly have consistently applauded it’s quality and reliability. There are Firefly customers who have logged over 3 years of usage and the product continues to deliver. 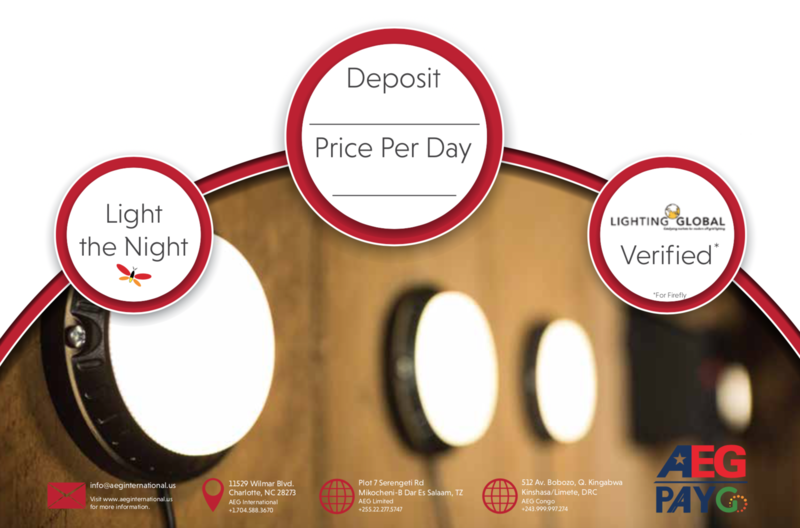 PAYG brings access to Firefly’s life-enhancing quality lighting and phone charging features to those who cannot afford the one-time purchase price of Firefly. With PAYG, working through your local in-country supplier, you make a minimal downpayment. This provides access to the PAYG unit with some initial days of “on time”. When those days expire, you contact the local provider and purchase more days at a rate that is typically even less than you might spend now for inferior solutions like kerosene or candles. The provider gives you a secure code which you enter on the front of the PAYG unit and the unit reactivates for the number of days.